Gucci Case For Iphone XR With Logo Black. Condition is New. Shipped with USPS First Class Package. Gucci Iphone 6s Case. Condition is Used. Shipped with USPS First Class Package. 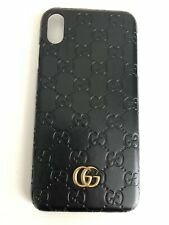 Gucci Marmont Case For Iphone XS Max With Logo Black Leather. Condition is New. Shipped with USPS First Class Package. Gucci Case For Iphone XS MAX with Logo Cardholder. Condition is New. Shipped with USPS First Class Package. Gucci Case For Iphone XS Max With Rainbow And Logo. Condition is New. Shipped with USPS First Class Package. Gucci Case For Iphone 7 Plus 8 Plus With Logo Snake. Condition is New. Shipped with USPS First Class Package. Gucci Case For Iphone X XS with Logo Snake. Condition is New. Shipped with USPS First Class Package. Gucci Case For Iphone XS MAX Black With Snake. Condition is New. Shipped with USPS First Class Package. Gucci Hard Shell Phone Case iPhone XS Max White. Condition is New. Shipped with USPS First Class Package. Authentic Gucci Embroidery Snake iPhone 7/8 Case. Condition is Used. Shipped with USPS First Class Package. This sleek case is constructed from plastic and TPU (rubber) material. This case easy to carry or slip inside your favorite handbag when you're on the go. Image printed with the advanced Laser Technology by using the latest and the most expensive machine for long lasting effect. Gucci Blooms/Snake iPhone 6 / 6s / 7 / 8 Case. Condition is Used. Slightly faded around the edges. Distressed look. Ships with USPS. 2018Gucci! Floral iPhone Wallet Case 6,7,8plus XR Max. Condition is New. Shipped with USPS First Class Package. Gucci Case For Iphone XR with Logo Rainbow. Condition is New. Shipped with USPS First Class Package. Authentic Gucci iPhone Case. for iPhone 7 (I have an iPhone 8 and it fits perfectly).